The biotech company Biomar Microbial Technologies has just announced that it has invested 2 million euros in the expansion of its León factory in order to produce kilograms of APIs (Active Pharmaceutical Ingredients) for the pharmacy, cosmetics, food, agriculture and energy sectors. Managing Director Antonio Fernandez Medarde states that this factory’s capacity for the production of active raw materials comes to over 3,000 liters in its different tanks, representing a major quantitative and qualitative increase. "We have the necessary infrastructure to become the laboratory for the development of production methods for new therapeutic entities. We have met GMP quality standards applying to international external laboratories and the large-scale production of pharmaceuticals, complying with international regulations in this area. According to Laura de Castro, a specialist in Fermentation and Processing, Biomar Microbial Technologies boasts three fundamental differences representing advantages over its competitors. Firstly, the production process which Biomar applies to prevent contamination. Secondly, the research-production and result issuance times for customers are faster than the average times offered by other companies. Finally, this new factory allows the company to offer third parties the very best R&D&I service and production in terms of price, quality and safety. With respect to the first point, Laura de Castro explains that Biomar prevents contamination by working with a single product line per campaign in the API processing and fermentation phases. In terms of safety, Cristina Alonso, a Quality expert with the company, also points out that 20% of investments were earmarked for the creation of a white room containing purified air in order to prevent the external pollution of the different substances. “The security of these facilities was reinforced by an area meeting the European Union’s ATEX directive governing the handling of any type of active raw material,” Alonso underscores. With regards to the second strategic difference: the reduction of research-production and development times for third party companies, these specialists stress that this expansion will allow the company to optimize scale-up processes, thereby bolstering effectiveness with low performance compounds and reducing response times to customer orders. “We reduce R&D&I production times because or company has the experience of having worked with a collection of 60,000 microorganisms from the sea, on which 40 scientists have worked, developing the production methods of over 50 molecules,” explains Antonio Fernández Medarde. In his opinion the expansion of Biomar’s API production factory comes in response to the growing demand for production exhibited by portions of the pharmaceutical, food, cosmetics and energy sectors. 95% of its capacity will be employed to serve foreign multinationals, while 5% will be for companies on the domestic market. “Despite the economic crisis, the major foreign multinationals from the U.S. and Europe have not reduced their outlays designated for research, unlike what is happening in our country,” says company Vice-president Arturo Ayats. This expansion, targeting industrial production for third parties, complements the continuous production of compounds, molecules and active raw materials carried out by the Biomar Microbial Technologies research team, whose collection of 60,000 useful marine microorganisms is considered the world’s largest. This new factory shall be dedicated to the production of small molecules and proteins which require bacteria, fungi and yeast fermentation processes or the cultivation of mammalian cells for the completion of preclinical and clinical studies. 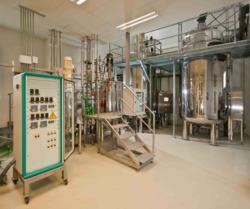 Through this factory expansion Biomar Microbial Technologies makes available to its customers its capacity to offer advanced therapy processes and products for pharmaceutical, cosmetic, food/agriculture and other industrial processes. “We currently offer the most cost-effective conditions in each phase of the API R&D process, in the least amount of time, with the best safety guarantees,” company executives indicate. BIOMAR MICROBIAL TECHNOLOGIES is a Spanish company specializing in Marine Microbiology Biotechnology and Natural Product Chemistry, dedicated to discovering, developing and producing new compounds and processes relevant to the treatment of various diseases and other areas related to improving people’s health and quality of life.